Vijay K. Gurbani is a distinguished member of technical staff in the End-to-End Mobile Networks Research group at Nokia Bell Labs, the research arm of Nokia Networks (fomerly Alcatel-Lucent and Lucent Technologies, Inc.). He holds a B.Sc. in Computer Science with a minor in Mathematics, a M.Sc. in Computer Science, both from Bradley University; and a Ph.D. in Computer Science from Illinois Institute of Technology. Vijay's current work is focused on scalable analytic architectures and algorithms for autonomic 5G networks: the volume and velocity of data produced in 5G will be far surpassed by data generated in today's communications networks and the ways to collect, cleanse, summarize and aggregate that data so it can be consumed by predictive models in real-time is a challenge. In the past, Vijay's work explored multimedia signaling protocols (Session Initiation Protocol, or SIP) and the security and privacy aspects of multimedia protocols. His earlier work proposed the use of SIP as a canonical protocol for executing services both in the Public Switched Telephone Network (PSTN) and the Internet. The results of these efforts was siptrans, a general-purpose SIP transaction layer library used to create SIP user agents, proxies, and registrars. The siptrans library was subsequently used as the basis for the Lucent Common SIP Stack (CSS), which is currently used in service provider networks of national and international companies. Another outcome of the work on CSS was the formalization of Corporate Open Source (COS), which is defined as use of open source techniques to develop commercial software. Today, COS plays a foundational role in the emerging domain of Inner Source, where it informs the taxonomy and helps define some of the roles in Inner Source. Vijay has authored or co-authored over 60 journal papers and conferencing proceedings, 5 books, 18 Internet Engineering Task Force (IETF) RFCs, and has 7 granted U.S. patents. Vijay's research interests are large scale (big data) analytics, scalable architectures for large-scale analytics, multimedia protocols, security and privacy in multimedia protocols, distributed programming, open/inner source and peer-to-peer networks. He is a senior member of the ACM, a member of the IEEE Computer Society and Usenix. He is currently the co-chair of the Application Layer Traffic Optimization (ALTO) Working Group in the IETF, which is chartered with designing a extensible protocol to enable efficient communications between peers in a peer-to-peer system. 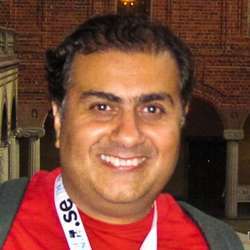 Vijay has also worked at Fermi National Accelerator Laboratory, where he was responsible for providing distributed programming tools and frameworks for data analysis over a high-availability computing infrastructure to a geographically disperesed team of astrophysicists (the Sloan Digital Sky Survey). After Fermilab, Vijay worked at Tellabs Operations Inc., where his primary responsibility was to introduce a TCP/IP protocol stack on a digital cross-connect telecommunications switch. This enabled the switch to be accessible over the Internet for provisioning services and extracting critical data using HTTP, a new and evolving protocol at that time. After Tellabs, he worked at Net Guru Technologies, a Chicago-area Internet startup that was successfully acquired by a larger competitor. Before Fermilab, Vijay worked as a consultant at Cap Gemini America, the North American branch of the French Cap Gemini Sogeti group of companies (now known as Cap Gemini Ernst & Young). Marchal, S., Mehta, A., Gurbani, V.K., Ho, T.K., State, R. and Sancier-Barbosa, F., "Mitigating mimicry attacks against the Session Initiation Protocol (SIP)," In IEEE Transactions on Network and Service Management (TNSM), pp. 467-482, 12(3), 2015. Basu, A., Fleming, S., Stanier, J., Naicken, S., Wakeman, I. and Gurbani, V.K., "The state of peer-to-peer network simulators", In ACM Computing Surveys, 45(4), pp. 46:1--46:25, August 2013. Gurbani, V.K. and Kolesnikov, V., "A Survey and Analysis of Media Keying Techniques in the Session Initiation Protocol (SIP)," IEEE Communications Surveys and Tutorials, 13(2), pp. 183-198, 2011. Bessis, T., Rana, A., and Gurbani, V.K., "Session Initiation Protocol (SIP) Firewall for Internet Multimedia Subsystem (IMS) Core," Bell Labs Technical Journal, 15(4), pp. 168-188, March 2011. Gurbani, V.K., Garvert, A., and Herbsleb, J.D., "Managing a Corporate Open Source Software Asset," Communications of the ACM, 53(2), pp. 155-159, February 2010. Gurbani, V.K., Hilt, V., Rimac, I., Tomsu, M., and Marocco, E, "A Survey of Research on the Application-Layer Traffic Optimization Problem and the Need for Layer Cooperation," IEEE Communications, Vol. 47, No. 8, pp. 107-112, August 2009. Cook, D.L., Gurbani, V.K., and Daniluk, M., "Phishwish: A Simple and Stateless Phishing Filter," Journal on Security and Communication Networks (SCN), Vol. 2, No. 1, pp. 29-43, January/February 2009, John Wiley & Sons. Gurbani, V.K., and McGee, A.R., "An Early Application of the Bell Labs Security Framework to Analyze Vulnerabilities in the Internet Telephony Domain," Bell Labs Technical Journal, Vol. 12, No. 3, pp. 7-19, November 2007. Gurbani, V.K., Jagadeesan, L.J., and Mendiratta, V., "Characterizing Session Initiation Protocol (SIP) Network Performance and Reliability," Springer Verlag Lecture Notes in Computer Science (LNCS), Vol. 3694, pp. 196-211, October 2005. Gurbani, V.K., Sun, X-H., and Brusilovsky, A., "Inhibitors for Ubiquitous Deployment of Services in the Next Generation Network," IEEE Communications, Vol. 43, No. 9, pp. 116-121, September 2005. Gurbani, V.K., and Sun, X-H., "A Systematic Approach for Closer Integration of Cellular and Internet Services," IEEE Network, Vol. 19, No. 1, pp. 26-32, Jan-Feb, 2005. Gurbani, V.K., and Sun, X-H., "Terminating telephony services on the Internet," IEEE/ACM Transactions on Networking, Vol. 12, No. 4, pp. 571-581, August 2004. Arlein, R.M., and Gurbani, V.K., "An extensible framework for constructing Session Initiation Protocol (SIP) User Agents," Bell Labs Technical Journal, Vol. 9, No. 3, pp. 87-100, November, 2004. Gurbani, V.K., and Jain, R., "Contemplating some open challenges in the Session Initiation Protocol (SIP)," Bell Labs Technical Journal, Vol. 9, No. 3, pp. 255-269, November 2004. Jayadevan, G., Gurbani, V.K., and Arlein, R.M., "Adapting SIP for Application Server requirements in 3G/UMTS networks," Bell Labs Technical Journal, Vol. 9, No. 3, pp. 57-71, November 2004. Gurbani, V.K., and Jain, R., "Transport protocol considerations for Session Initiation Protocol (SIP) networks," Bell Labs Technical Journal, Vol. 9, No. 1, pp. 83-97, July 2004. Gurbani, V.K., and Liu, K.Q., "Session Initiation Protocol: Service Residency and Resiliency," Bell Labs Technical Journal, Vol. 8, No. 1, pp. 83-94, July 2003. Dianda, J.R., Gurbani, V.K., and Jones, M.H., "Session Initiation Protocol (SIP) Services Architecture," Bell Labs Technical Journal, Vol. 7, No. 1, pp. 3-23, July 2002. Chiang, T-C., Gurbani, V.K., and Reid, J.B., "The need for third party call control," Bell Labs Technical Journal, Vol. 7, No. 1, pp. 41-46, July 2002. Gurbani, V.K., Chiang, T-C., and Kumar, S., "SIP: A Routing Protocol," Bell Labs Technical Journal, Vol. 6, No. 2, pp. 136-152, December 2001. Chiang, T-C., Douglas, J., Gurbani, V.K., Montgomery, W.A., Opdyke, W.F., Reddy, J., and Vemuri, K., "IN Services for Converged (Internet) Telephony," IEEE Communications, Vol. 38, No. 6, pp. 108-115, June 2000. Gurbani, V.K., "Managing embedded TCP servers," Embedded Systems Programming, Vol. 10, No. 10, pp. 106-114, October 1997. Eric Falk, Vijay K. Gurbani and Radu State, "Query-able Kafka: An agile data analytic pipeline for mobile wireless networks,", accepted for publication, In Proceedings of the 43rd International Conference of Very Large Data Bases (VLDB 2017), Munich, Germany, August 2017. Mendiratta, V., Gurbani, V.K., Phadke, C. and Migliosi, A., "Exploring anomalous behaviour in wireless networks with visual analytics," In Visualization in Practice Track, IEEE Visualization Conference (VIS 2015), Chicago, Illinois, October 2015. Gurbani, V.K., Migliosi, A., State, R., Payette, C., Cilli, B. and Engel, T., "A characterization of short-video and distributed hot-spot activity in Instagram," In Proceedings of the 8th ACM International Conference on Principles, Systems and Applications of IP Telecommunications (IPTComm 2015), pp. 28-34, Chicago, Illinois, October 2015. Jagadeesan, L., Mc Bride, A., Gurbani, V.K. and Yang, J., "Cognitive security: Security analytics and autonomics for virtualized networks," In Proceedings of the 8th ACM International Conference on Principles, Systems and Applications of IP Telecommunications (IPTComm 2015), pp.43-50, Chicago, Illinois, October 2015. Fossati, T., Gurbani, V.K., Kolesnikov, V., "Love all, trust few: On trusting intermediaries in HTTP," In Proceedings of the ACM SIGCOMM Workshop on Hot Topics in Middleboxes and Network Function Virtualization (HotMiddlebox 2015), pp. 1-6, August 2015. Zhang, Y., Clouet, A., Awotayo, O.S., Davids, C. and Gurbani, V.K., "Benchmarking the Session Initiation (SIP) protocol," In IEEE 2015 Annual Communications Quality and Reliability Workshop (CQR), pp. 1-6, May 2015. Goergen, D., Migliosi, A., Gurbani, V.K., State, R. and Engel, T., "Spatial and temporal analysis of Twitter: A tale of two countries," In 7th ACM International Conference on Principles, Systems and Applications of IP Telecommunications (IPTComm 2014), Chicago, Illinois, Sept.-Oct., 2014. Al-Omari, D., Gurbani, V.K. and Anjali, T., "A novel architecture for a Computer Network Defense (CND) system using Content Addressable Networks (CAN)," In 1st International Workshop on Management and Security Technologies for Cloud Computing (ManSec-CC), held in conjunction with IEEE Globecom 2012, pp.758-762, December 2012. Scharf, M., Voith, T., Roome, W., Gaglianello, B., Steiner, M., Hilt, V., and Gurbani, V.K., "Monitoring and abstraction for networked clouds", In Proceedings of the 16th International Conference on Intelligence in Next Generation Networks (ICIN), pp. 80 - 85, Berlin, Germany, October 2012. Steiner, M., Gaglianello, B., Gurbani, V.K., Hilt, V., Roome, W.D., Scharf, M. and Voith, T., "Network-aware service placement in a distributed cloud environment", In Proceedings of the ACM SIGCOMM 2012 Conference on Applications, Technologies, Architectures, and Protocols for Computer Communications (SIGCOMM), pp. 73-74, Helsinki, Finland, August 2012. Gurbani, V.K., Scharf, M., Lakshman, T.V. and Hilt, V., "Abstracting network state in Software Defined Networks (SDN) for rendezvous services," In Workshop on Software Defined Networks (SDN), held in conjunction with IEEE International Conference on Communications (ICC), pp. 6627--6632, June 2012. Mehta, A., Hantehzadeh, N., Gurbani, V.K., Ho, T.K., Koshiko, J. and Vishwanathan, R., "On the inefficacy of Euclidean classifiers for detecting self-similar Session Initiation Protocol (SIP) messages," In Proceedings of the 12th IFIP/IEEE International Symposium on Integrated Network Management (IM 2011), pp. 329-336, May 2011, Dublin, Ireland. Hantehzadeh, N., Mehta, A., Gurbani, V.K., Gupta, L., Ho, T.K. and Wilathgamuwa, G., "Statistical analysis of self-similar Session Initiation Protocol (SIP) messages for anomaly detection," In Proceedings of the 4th IFIP/IEEE International Conference on New Technologies, Mobility, and Security (NTMS 2011), pp. 1-5, February 2011, Paris, France. Gurbani, V.K., Burger, E., Anjali, T., and Davids, C., "SIP CLF: A Common Log Format (CLF) for the Session Initiation Protocol", In Usenix workshop on Managing Systems via Log Analysis and Machine Learning Techniques (SLAML '10), October 3, 2010, Vancouver, Canada. Gurbani, V.K. and Kolesnikov, V., "Work in progress: A secure and lightweight scheme for media keying in the Session Initiation Protocol (SIP)," In Proceedings of the 4th Annual ACM Conference on Principles, Systems and Applications of IP Telecommunications (IPTComm 2010), pp. 32-41, August 2-3, 2010, Munich, Germany. Cook, D.L., Gurbani, V.K., and Daniluk, M., "Phishwish: A Stateless Phishing Filter using Minimal Rules," In Proceedings of the 12th International Conference on Financial Cryptography and Data Security (FC 08), LNCS 5143, Tsudik, G. (Ed. ), Springer- Verlag, pp. 182-186, 2008. Gurbani, V.K., Cook, D.L., Menten, L.E., and Reddington, T.B., "A Case Study on Constructing a Security Event Management System," In Proceedings of the German Informatics Society's 3rd International Conference on IT-Incidence Management and IT-Forensics, pp. 83-102, September 2007, Stuttgart, Germany. Gurbani, V.K. Willis, D., and Audet, F., "Cryptographically Transparent Session Initiation Protocol (SIP) Proxies," In Proceedings of the IEEE International Conference on Communications (ICC), pp. 1185-1190, June 2007, Glasgow, UK. Gurbani, V.K., Garvert, A., and Herbsleb, J., "A Case Study of Corporate Open Source Development Model," In Proceedings of the 28th ACM International Conference of Software Engineering (ICSE 2006), pp. 472-481, May 2006, Beijing China. Brusilovsky, A., Gurbani, V.K., and Mizikovsky, S., "Network Protocol Extensions: Are They Bad? ", In 10th IEEE/ITU-T Conference for Intelligence in Next Generation Networks (ICIN), May 2006, Bordeaux, France. Gurbani, V.K., Jagadeesan, L.J., and Mendiratta, V.B., "Characterizing Session Initiation Protocol (SIP) Network Performance and Reliability," In Proceedings of the ISAS 2005 (International Service Availability Symposium) Conference, April 25-26, 2005, Berlin, Germany. Gurbani, V.K., and Sun, X.-H., "Extensions to an Internet signaling protocol to support telecommunication services," In Proceedings of the 2004 IEEE Global Telecommunications Conference (GLOBECOM), pp. 1640-1644, Nov.-Dec., 2004. Gurbani, V.K., and Sun, X-H., "Accessing Telephony Services from the Internet," In Proceedings of 2003 IEEE International Computer Communications and Networks Conference (ICCCN), pp. 517-523, October 2003. Gurbani, V.K., and Sun, X-H., "Services Spanning Heterogeneous Networks," In Proceedings of the 2003 IEEE International Conference on Communications (ICC), pp. 764-768, May 2003, Anchorage, Alaska (US). Gurbani, V.K., Sun, X-H., Brusilovsky, A., Faynberg, I., Lu, H-L., and Unmehopa, M., "Internet Service Execution for Telephony Events," In Proceedings of the 2003 IEEE/ITUT Conference for Intelligence in Next Generation Networks (ICIN), April 2003. Brusilovsky, A., Gurbani, V.K., Qutub, S., Tsioras, C., and Varney, D., "Programmable Selection of Radio Access Networks Utilizing Application Layer Protocols," In Proceedings of the 2003 IEEE/ITU-T Conference for Intelligence in Next Generation Networks (ICIN), April 2003. Gurbani, V.K., and Dickens, P.M., "Parallel Discrete Event Simulation for an Internet Telephony Call Signaling Protocol," In Proceedings of 2001 Summer Simulation Conference (SCS), July 2001. Gurbani, V.K., and Dickens, P.M., "Issues in Parallel Discrete Event Simulation for an Internet Telephony Call Signaling Protocol," In Proceedings of the 2000 Summer Simulation Conference (SCS), July 2000. Brusilovsky, A., Buller, J., Conroy, L., Gurbani, V.K., and Slutsman, L., "PSTN Internet Notification (PIN): proposed architecture, services and protocols," In Proceedings of the 2000 IEEE/ITU-T Conference on Intelligence in Networks (ICIN), January, 2000. Petravick, D., Berman, E., Gurbani, V.K., Nicinski, T., Pordes, R., Rechenmacher, R., Sergey, G., and Lupton, R., "Software Engineering Methods and Standards Used in the Sloan Digital Sky Survey (SDSS)," In Proceedings of the 4th Internation Workshop on Software Engineering and Artificial Intelligence for High Energy and Nuclear Physics, April 1995. Petravick, D., Berman, E., Gurbani, V.K., Kent, S., Nicinski, T., Pordes, R., Rechenmacher, R., Sergey, G., Lupton, R., and Richmond, R., "The Sloan Digital Sky Survey's Use of the Web," In Proceedings of Weaving the Astronomy Web (WAW), April 1995. Kent, S.M., Stoughton, C., Newberg, H., Loveday, J., Petravick, D., Gurbani, V.K., Berman E. and Sergey, G., "Sloan Digital Sky Survey," In Proceedings of Astronomical Data Analysis Software and Systems III, ASP Conference Series, Volume 61, pp. 205- 2014, 1994. Berman, E., Gurbani, V.K., MacKinnon, B., Newberg, H., Nicinski, T., Petravick, D., Pordes, R., Sergey, G., Stoughton, C., and Lupton, R., "The Distributed Development Environment for SDSS software," In Proceedings of 1994 Computing in High Energy Physics (CHEP), September 1994. Davids, C., Gurbani, V.K. and Poretsky, S., "Methodology for benchmarking Session Initiation Protocol (SIP) devices: Basic session setup and registration," IETF RFC 7502 (Informational), April 2015. Davids, C., Gurbani, V.K. and Poretsky, S., "Terminology for benchmarking Session Initiation Protocol (SIP) devices: Basic session setup and registration," IETF RFC 7503 (Informational), April 2015. Gurbani, V.K., Hilt, V. and Schulzrinne, H., "Session Initiation Protocol (SIP) overload control," IETF RFC 7339 (Proposed Standard), September 2014. Gurbani, V.K., Burger, E., Anjali, T., Abdelnur, H. and Festor, O., "The Common Log Format (CLF) for the Session Initiation Protocol (SIP): Framework and Information Model," IETF RFC 6872 (Proposed Standard), February 2013. Salgueiro, G, Gurbani, V.K. and Roach, A., "Format for the Session Initiation Protocol (SIP) Common Log Format (CLF)," IETF RFC 6783 (Proposed Standard), February 2013. Marocco, E., Fusco, A., Rimac, I. and Gurbani, V.K., "Improving Peer Selection in Peer-to-Peer networks," IETF RFC 6821 (Informational), December 2012. Camarillo, G., El Malki, K. and Gurbani, V.K., "IPv6 transition in the Session Initiation Protocol (SIP)," IETF RFC 6157 (Proposed Standard), April 2011. Rimac, I., Hilt, V., Tomsu, M., Gurbani, V.K. and Marocco, E., "A survey on research on the application-layer traffic optimization (ALTO) problem," IETF RFC 6029 (Informational), October 2010. Gurbani, V.K., Carpenter, B. and Tate, B., "Essential corrections for IPv6 ABNF and URI comparison in RFC3261," IETF RFC 5954 (Proposed Standard), August 2010. Lawrence, S. and Gurbani, V.K., "Extended Key Usage (EKU) for Session Initiation Protocol (SIP)," IETF RFC 5924 (Experimental), June 2010. Gurbani, V.K., Mahy, R. and Tate, B., "Connection Reuse in the Session Initiation Protocol," IETF RFC 5923 (Proposed Standard), June 2010. Gurbani, V.K., Lawrence, S. and Jeffrey, A., "Domain Certificates in the Session Initiation Protocol (SIP)," IETF RFC 5922 (Proposed Standard), June 2010. Jennings, C. and Gurbani, V.K., "The Internet Assigned Number Authority (IANA) tel Uniform Resource Identifier (URI) Parameter Registry," IETF RFC 5341 (Proposed Standard), September 2008. Gurbani, V.K., Boulton, C., and Sparks, R., "Session Initiation Protocol (SIP) torture test messages for Internet Protocol version 6 (IPv6)," IETF RFC 5118 (Informational), February 2008. Gurbani, V.K., and Jennings, C., "Representing Trunk Groups in sip/tel Uniform Resource Identifiers (URIs)," IETF RFC 4904 (Proposed Standard), June 2007. Schulzrinne, H., Gurbani, V.K., Kyzivat, P., and Rosenberg, J., "RPID: Rich Presence Extensions to the Presence Information Data Format," IETF RFC 4480 (Proposed Standard), July 2006. Gurbani, V.K., H aerens, F., and Rastogi, V., "Interworking SIP and Intelligent Network (IN) Applications," IETF RFC 3976 (Informational), January 2005. Gurbani, V.K., (Ed. ), Faynberg, I., Lu, H-L., Brusilovsky, A., Gato, J., and Unmehopa, M., "The SPIRITS (Services in PSTN requesting Internet Services) Protocol," IETF RFC 3910 (Proposed Standard), October 2004. Mendiratta. V., Gurbani, V.K., and Phadke, C., "Anomaly detection in mobile phone data --- Exploratory analysis using Self-Organizing Maps," MIT Media Lab NetMob Conference, April 2015. Gurbani, V.K. and Ho, T.K., "Detecting anomalies in text-based protocols without parsing," In the 2nd Bell Labs Science Workshop, December 6-7, 2011, Villarceaux, France. Marocco, E., Gurbani, V.K., Hilt, V., Rimac, I., and Tomsu, M., "Peer-to-Peer Infrastructure: A Survey of Research on the Application-Layer Traffic Optimization Problem and the Need for Layer Cooperation," In IETF Workshop on Peer-to-peer Infrastructure, May 28, 2008, Massachusetts Institute of Technology, Cambridge, MA, USA. Gurbani, V.K., Garvert A., and Herbsleb, J.D., "Managing a Corporate Open Source Asset," unpublished manuscript presented at ACM OOPSLA Workshop on Integration of Open Source Components into Large Software Systems, October 2007, Montreal, Canada. Prasad, A.R., Buford, J.F. and Gurbani, V.K. (Editors), Advances in Next Generation Services and Service Architectures, River Publishers, June 2011. Prasad, A.R., Buford, J.F. and Gurbani, V.K. (Editors), Future Internet Services and Service Architectures, River Publishers, April 2011. Gurbani, V.K. and Khirman, S., "Seven days in the life of two BitTorrent swarms", Book chapter in a monograph entitled Evolution of Peer-to-peer technologies: Optimization, security and applications, Bertrand Mathieu (Ed. ), Hermes Science Publishing, Ltd., April-May 2010. Pabrai, U.O., Gurbani, V.K., Teitelbaum, J.T., Gregory, S.D., and King, G.A., Webmaster Engineer Certification Handbook, McGraw Hill Publishing Company, November 1997. Pabrai, U.O., and Gurbani, V.K., Internet and TCP/IP Network Security, McGraw Hill Publishing Company, September 1996. Kolesnikov, V. and Gurbani, V.K., "Efficient Key Management System and Method," U.S. Patent Number 9,106,628; Issued August 11, 2015. Cook, D., Gurbani, V.K. and Wegdam, M., "Method and apparatus for generating onetime passwords," U.S. Patent Number 8,954,745; Issued February 10, 2015. Cook, D., Gurbani, V.K. and Reddington, T., "Methods For Selectively Capturing And Replicating One-Time Password Generator Functionality From Device To Device," U.S. Patent Number 8,788,835; Issued July 22, 2014. Gurbani, V.K., S. Sabnis, V. Hiering, L. Nieto, B. Kumar, A. Gokhale, R.B. Hull, R.P. Klemm, and G. Zhou, "Customer relationship management system with network contact center server configured to control automated web and voice dialogues," U.S. Patent Number 8,024,401; Issued September 20, 2011; Filed: June 3, 2002. Brusilovsky, A., Gurbani, V.K., Jain, A., Montgomery, W.A., "Instant Presence System for a Guaranteed Call Connection," U.S. Patent Number 7,050,810; Issued May 23rd, 2006; Filed: July 22nd, 2002. Gurbani, V.K., and Jain, A., "Telephone Caller Identification Log with Internet Access," U.S. Patent Number 6,282,275, Issued: August 28th, 2001; Filed: August 7th, 1998. Brusilovsky, A., Gurbani, V.K., Jain, A., and Varney, D., "PSTN-Internet Notification Services," U.S. Patent Number 6,819,667, Issued: November 16th, 2004; Filed: August 5th, 1999. Mc Bride, A., Jagadeesan, L., Moser, M. and Gurbani, V.K., "Dynamic Reconfiguration Of Resources In A Virtualized Network," U.S. Patent file date June 12, 2015. Mc Bride, A., Jagadeesan, L., Moser, M. and Gurbani, V.K., "Machine Learning and Analytics-Driven Security Autonomics," U.S. Patent file date February 12, 2015. Gurbani, V.K. and Ho, T.K., "Determining validity of SIP messages without parsing," U.S. Patent file date: August 25, 2011. Gurbani, V.K., "Security Event Routing in a Distributed Hash Table," U.S. Patent file date December 3, 2013.